This was communicated to officials of the Guyana Forestry Commission (GFC) when they met with DTL personnel on Monday. Changes to the saw mill were in keeping with Occupational Health & Safety regulations. The company indicted to the GFC that once the greenlight is given operations will resume and the 45 affected employees who currently receive part payment will be reinstalled. The meeting between GFC and the timber company was mandated by Minister of Natural Resources Raphael Trotman following a visit by himself and Minister within the Ministry of Natural Resources, Simona Broomes to DTL’s Mabura Hill, Region 10 location recently. The ministers had made an impromptu visit to the location after reading a report in the Guyana Chronicle that 45 workers’ jobs were in limbo. 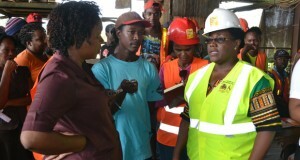 While the company’s official-Kwangsiong Chuo had assured the Government Ministers that the workers were being paid part of their salaries and were not in danger of losing their jobs, senior officials were invited to a meeting with GFC for a full assessment of its operation in Guyana. The move by the company to have the 45 workers off the job followed a December 10, 2015 inspection of its location by a team led by Minister Broomes where it was found that the company was in breach of Chapter 99 of the Occupational Safety and Health Act. Chief among the issues raised by Minister Broomes, and which was communicated to DTL in writing, was the fact that a sawmill operator was operating a lever without adequate safety provisions. Upon instruction the company ceased its operations to rectify the breaches and all employees were paid 50% of their salaries between December 19th, 2015 and January 3rd, 2016. From January 8th, 2016 the 45 affected workers received 30% of their salaries as per agreement with their union, Guyana Agriculture Workers’ Union (GAWU).